Billy Joel, Shades of Grey, released 1993. Stephanite, Husky Mine, Mayo Mining District, Yukon Territory, Canada. 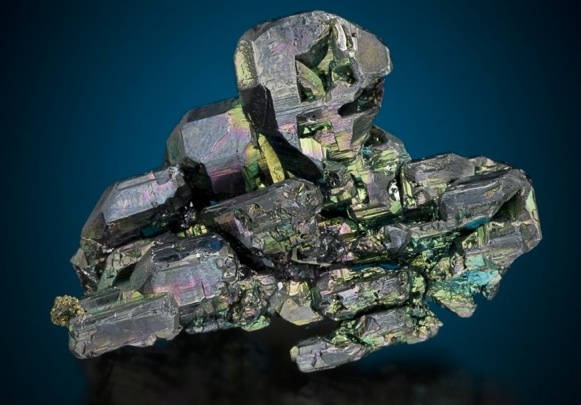 The crystal group is approximately 6.3 cm across, and outstanding for the locality; Husky Mine polybasite and stephanites typically have an iridescence that it probably caused by light reflection/refraction in a very thin coating of an unknown silicate. Jeff Scovil Photo. In the mid 1980s I was first asked to be a judge of the competitive mineral exhibits at the Tucson Gem and Mineral Show. At that time the TGMS competition, and its two top awards – the McDole Trophy (best case of minerals entered into competition) and the Lidstrom Trophy (best individual mineral entered into competition) – were considered the pinnacle of the mineral world. The winners of these awards looked like a “Who’s Who” of the mineral collecting community, and every year the competition was passionate and savage. The rules for the McDole and Lidstrom awards were few; it was based on the judges experiences, biases, and an element of luck on who decided to enter the competition. The judging for the McDole and Lidstrom awards was also a “discussion” rather than some type of formal poll — a judge with a domineering personality could filibuster the other judges into accepting his or her opinion. I recall clearly the discussion around a particular specimen entered into the Lidstrom competition that I was fond of; “We can’t possibly consider that specimen a best – it has been repaired!” The pronouncement carried such an air of academic certitude that I immediately agreed. Of course, it had been repaired! How could it really be a great mineral specimen if there was some glue involved! It was not too long after that I began to ponder the absurdity of dismissing anything that is repaired as inherently flawed (on a personal note, now that I have multiple metal parts in various joints, I embrace the repaired). Repairing a mineral is rather common – mineral extraction is inherently a violent activity, and the very act of handling a specimen introduces the possibility of drops, dings and scratches. But there is still a feeling that repairs should affect the monetary value of a specimen. I don’t think I have ever been to mineral show where I have not heard some version of the conversation between a dealer and a collector where the potential purchaser doesn’t ask for a significant discount because the specimen has been repaired. The stephanite pictured at the top of this article is a fantastic complex crystal from the Husky Mine in the Yukon Territory, Canada. I first committed to buying this piece for my collection around the year 2000. However, when I went to go pick it up from the dealer I opened the box and the marvelous sample of “brittle silver” was in three pieces! The stress of transport had caused the crystal to part along inter-growth boundaries. I was heart broken, and walked away from a masterpiece. The dealer repaired the piece expertly, and eventually I was able to acquire it. However, several years later I was transporting it to be photographed and it “parted” again! Fortunately, it was once again restored, and now sits permanently in my mineral cabinet never to travel again. I believe it is the best, or one of the best, Husky Mine stephanites in existence, and the fact that it has some clear cyanoacrylate helping to hold it together is inconsequential. Repair would, thus, seem to be a rather “black and white” issue – restoring a collectable to its original configuration is not fraud or even misrepresentation of nature. Sadly, it is not “black and white”, and repair/restoration has become a spectrum disorder in the mineral collecting world. Today many consider filling missing gaps in crystals with acrylic resin, buffing away scratches on crystal faces or even heating a specimen to “restore” its primordial color as simply “sophisticated repair”. Not black and white, but shades of grey. The Pieta, carved by Michelangelo in the 16th century. The statue has been repaired a number of times in the last 500 years — most recently removing the damage done by a geology hammer (!) wielded by a lunatic. The Pieta is a signature masterwork of Italian sculptor Michelangelo, and one of the most famous works of art in history. Michelangelo was only 23 years old when he carved the single block of Carrara marble into a haunting image of a crucified Jesus being held by his mother. By any figure of merit, the Pieta is priceless. Yet, it is repaired – several times! 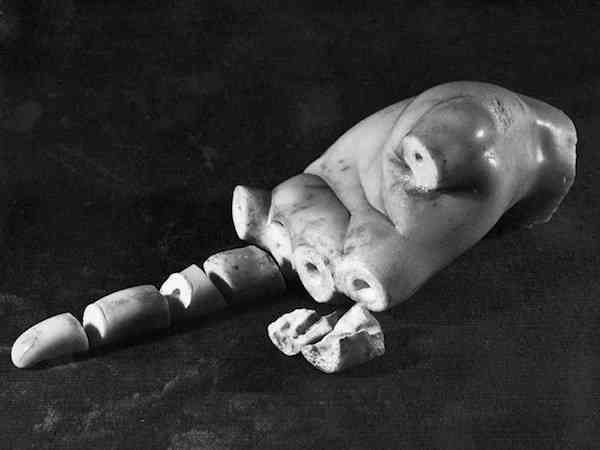 The four fingers of Mary’s left hand were snapped off during a move in the 18th century (restored in 1736). The most egregious damage occurred in an instant of insanity when Laszio Toth, an unemployed Hungarian geologist attacked. Toth struck the Pieta more than a dozen times with his field hammer, breaking off Mary’s arm, part of her nose, and chipping her face. Mary’s hand after the Toth attack. More than a hundred fragments of marble had to be reassembled to restore the Pieta. The repair of the statue was done by a team of 10 people painstakingly reassembling the fragments and filling in voids with a mixture of powdered marble and polyester resin. When the restore work was unveiled it was claimed that it was impossible to identify where the damage had been. Some experts suggest that with the passage of time the resin has perceptibly changed color, but in general the repair has faded into history and the magnificence of the Pieta has been restored. 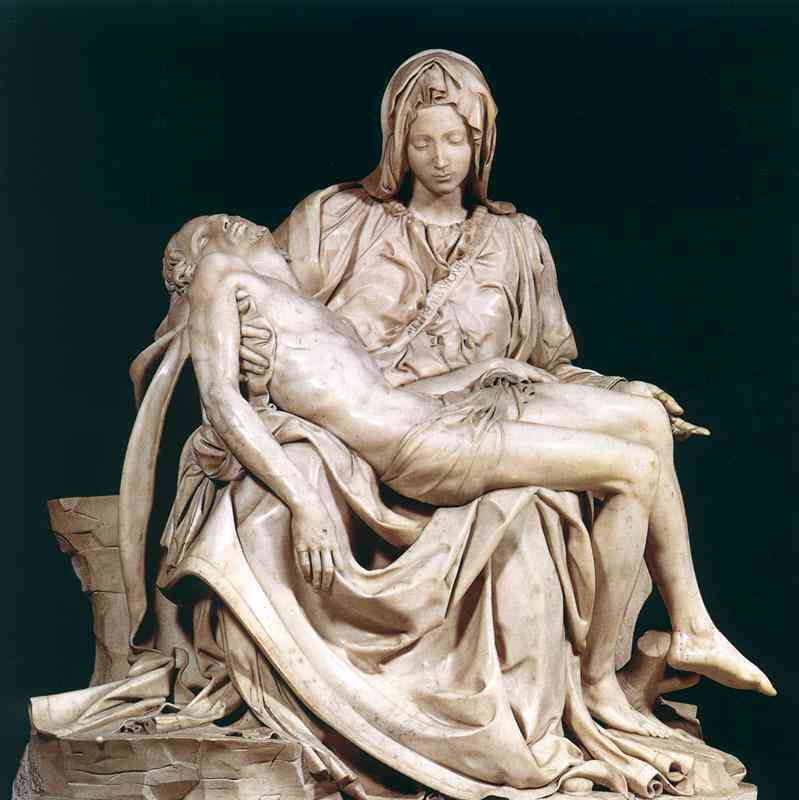 The restoration of the Pieta might be a fanciful stretch as an analogy for mineral repair, but it does frame the philosophy of specimen “value”. It is highly unlikely that the reconstruction of Mary’s left hand would effect the value of the Pieta if the Vatican decided to part with the treasure; I can’t imagine any art collector asking the Vatican for a “discount” because the marble was not exactly as Michelangelo carved it long ago. On the other hand, the restoration process went to great lengths to assure that nothing changed from the original – no added expression to Mary’s face, no extra lamb seated at her feet. The Alma Queen; a 10 cm, complex rhomb of rhodochrosite perched in a matrix of fine quartz crystals. This “rock” was found in 1966 at the Sweet Home MIne, and has been called the finest mineral specimen in the world. In 1966, a 90 year old silver mine located on the slopes of Mt Bross – one of Colorado’s 53 peaks that have elevations in excess of 14,000 feet above sea level – yielded a remarkable mineral specimen. 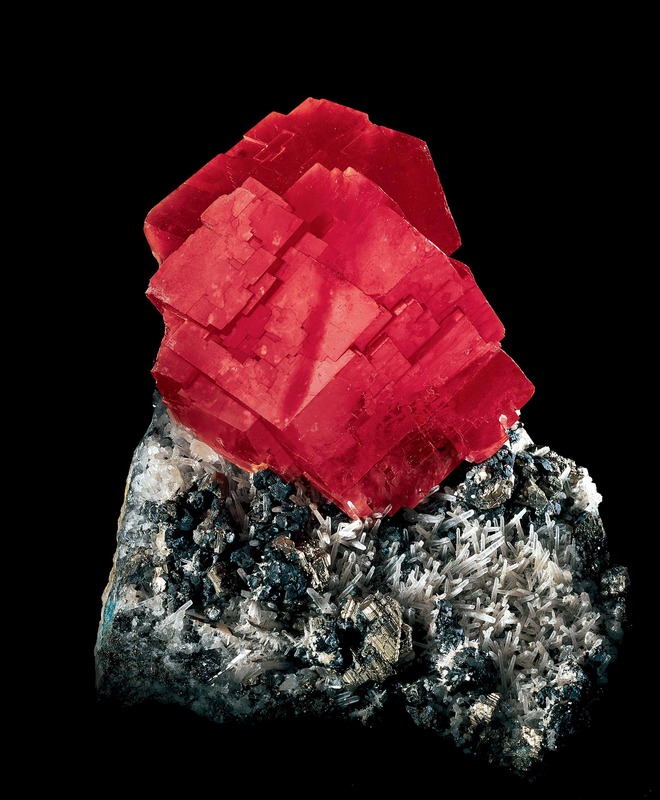 The mine was called the Sweet Home, and during its on-again, off-again mining history had periodically produced some of the world’s best rhodochrosite. However, the standard for rhodochrosite was reset when a mining crew drilled into a pocket and found a 10 cm rhombohedron of cherry red rhodochrosite perched on a slab of pencil thin white quartz. The specimen was purchased by one of Colorado’s earliest fine mineral dealerships, Crystal Gallery, for the princely sum of $2500. Crystal Gallery was a partnership between Merle Reid and Colorado collector legend George Robertson. 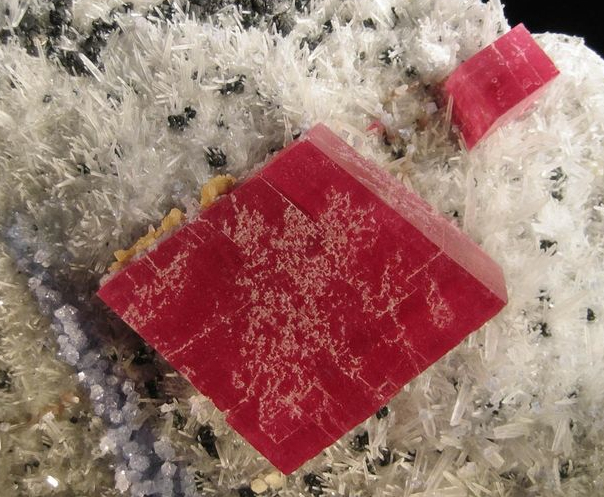 The rhodochrosite ended up in the hands of Peter Bancroft (much to the chagrin of George Robertson), who christen the piece as the “Alma Queen”, in recognition of the mining town a few miles southeast of the Sweet Home Mine (the picture above is “official” photo of the Alma Queen from its present home, the Houston Museum of Natural Science). In short order the Queen passed through a hands of a number of famous mineral dealers, finally becoming a prized possession of Perkins Sams. In 1986, Sams sold the Queen to Houston Museum – and a few years later it was being moved and was broken! Actually, it was not too surprising given that the rhodochrosite has perfect cleavage, and the huge crystal was isolated and perched on matrix. Fortunately, the crystal was “repaired” – it is impossible to see the glue reattaching the rhomb – and is still considered a masterpiece. The Alma Queen enticed others to want to return to the Sweet Home Mine and search for more rhodochrosite. 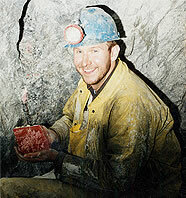 In 1991 Bryan Lees and partners began a professional and systematic exploration for mineral specimens. In 1992 Lees’ operation discovered a 1.5 meter long pocket that yielded incredible — larger than even the Alma Queen — specimens. Most of the crystals were detached from matrix, jarred from their natural perches by the mining activity. The largest of the crystals was more than 15 cm across, and was dubbed the Alma King. Bryan Lees holding the Alma King, just outside the Rainbow Pocket. The crystal was some 15 cm across! The Alma King was eventually reattached to matrix, and was brought to the Tucson Gem and Mineral Show in 1993. I remember seeing the specimen, and was stunned. I also recall standing next to a old time collector who remarked “too bad it is repaired”. Wow – my thoughts were not conflicted at all – the repair was sincere and returned a natural masterpiece to it’s rightful magnificence. It was exactly like the restoration of the Pieta! The Alma King – repaired. The specimen now sits in the Denver Museum of Natural History. There is little argument that the repair of the Sweet Home rhodochrosites was the right course of action, and certainly did not diminish the value of the specimens. However, it also coincided with the crest of a darker tsunami in the collecting hobby that demanded specimen perfection, and art aesthetics overtaking all other metrics of mineral specimen evaluation. A significant percentage of the Sweet Home specimens required repair, although the evolving euphemism was “specimen preparation”; a dialog developed around the theme of “returning the specimen to the condition it was in nature”. This catch phrase has become the a divide between collectors; those that prize the art of mineral specimens are willing to see flaws removed by polish and resins, while other collectors recoil at any man-induced enhancements and celebrate only that which can be documented “as found”. This gulf is wide, and brings cries of “fake and fraud” from collectors in the later group when they view many of the world’s best mineral specimens. However, this group of collectors – the old school – is dying away. Not yet irrelevant, but mostly marginalized. I am old school. The cover of the Mineralogical Record, January 2015. 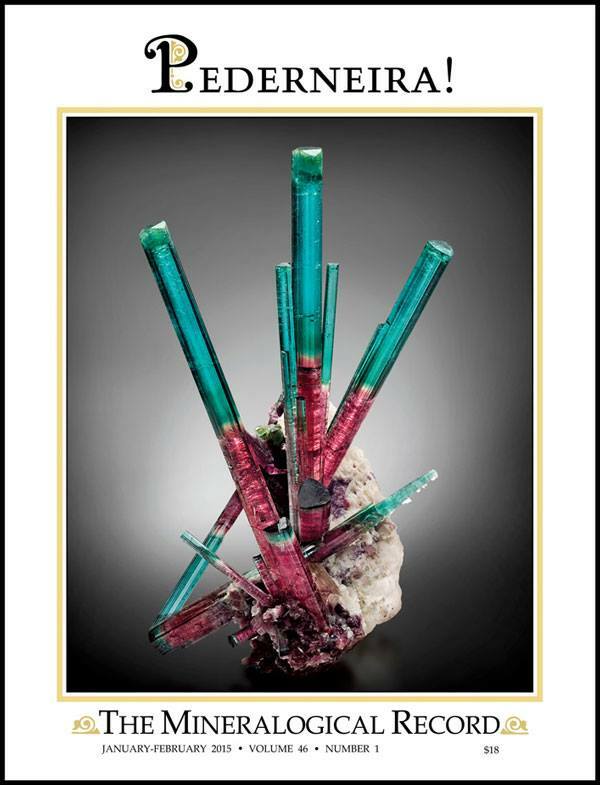 On the cover is one of the most amazing tourmaline specimens in existence, and the volume is full of information on the Pederneira mine. What is missing is the painstaking history of specimen repair and restoration – much work is done with added materials. In the last 50 years the mineral collecting hobby has seen dramatic changes – or perhaps evolution. What was once the realm of rockhounds is now a glided age of art. One of the most obvious symptoms of this change is what collectors accept and expect in a mineral specimen. Repair and restoration have always been important for mineral specimens; however, the definition of repair and restore has changed as prices have escalated. There has always been a desire to make specimens attractive, but today it is expected that many specimens are oiled, waxed or sprayed with silicon to enhance their luster and hide their imperfections. Use of these cosmetic trappings was once a “red line” for collectors – absolutely rejected. But just like US foreign policy on the use of chemical weapons, that red line was faded to grey. A tour through the many hotel rooms of the “high end” mineral dealers participating in the 2015 Westward Look Fine Mineral Show in Tucson (February 6-8) reinforces this dramatic shift; it is fair to say that most expensive fluorite specimens for sale have been treated with oil, every recent amazonite dug from the pegmatites in the high peaks of Colorado has been “juiced” to enhance the luster, and most gem-quality garnets are getting at least a spray of enhancement. And, further, casual conversation with collectors seems to reinforce that this is what they want. Perfection is essential for a work of art. The desire to “improve” minerals is a couple of thousand years old. There is written accounts of Greeks using cedar oil on emeralds to enhance the color. The purpose of the oil was to fill the flaws and cracks with a material (the oil) such that when light is shined on the crystal there would not be reflections from the imperfections. The cedar oil had approximately the right index of refraction (about the same as the emerald itself), and low enough viscosity (when heated) to flow into the tiny cracks, but high enough such that it would remain (at least for a while) after treatment. Today the oil is mixed with a polymer which “fixes” the oil. There are about a half dozen “restoration” labs in the US that work on minerals, and most have proprietary processes to do essentially the same thing as the cedar oil treatment except for fluorite, sphalerite, garnet, etc. The science behind these processes is fairly sophisticated — but the treatment is rarely disclosed. Classic Gary Larson cartoon – Rowing in Circles. This reminds me of specimen restoration – dealers on one side, collectors on the other. Dealers provide what collectors want, and collectors hear from dealers what specimen perfection should be. It is just rowing in circles. Today it is hard to “lay blame” for the practice of mineral restoration that relies on removing perceived imperfections at the doorstep of dealers. The nature of the “trophy collector” is to find perfection – and that sense of perfection does not have to be the hand that nature dealt. Further, it is clear that repair and restoration no longer decrease specimen value, but actually increase value. As Sir Walter Scott opined: Oh what a tangled web we weave, When first we practice to deceive. I love collecting minerals – it is something that I have done with passion for more than 50 years. I have changed along the way, and the hobby has changed even more than I. I am deeply disturbed by many of the changes, but that does not make them “wrong”. Just as I am aghast at at what I perceive as the personal values of generations other than mine, my sense of why I collect, and what a mineral specimen means to me, does not have to be shared with others. The Dalai Lama says: “Happiness is not something ready made. It comes from your own actions.” I don’t need to change what and how I collect. It is the science and human story that are codified and crystallized in my minerals. That is why I happily collect that which is repaired and total reject oils and waxes. A red line. Posted on February 8, 2015 March 16, 2015 by wallaceterrycjr	This entry was posted in Mineral Collections, Uncategorized and tagged mineral collecting, silver minerals, Tucson Gem and Mineral Show. Bookmark the permalink. thanks for the kind words. BTW, I don’t believe I have seen you at the Westward Look show before – we must get you this event even if it is sort of strange experience. Great article!! Like you, I am “Old School” and find your argument solid. While searching for ideas on labels for my mineral collection, I clicked on a Google link to your articles hoping to find inspiration for creating my own labels. My first inclination was that this site didn’t have what I was looking for, but it took only a quick read to convince me that I had found articles worth a better examination. What followed was a pleasurable evening of reading material that not only captivated and enlightened me, but also resonated strongly with my thoughts on the state of collecting today. Thank you for taking the time to share your knowledge and stories.